It will be unmistakable that you offer a warm and welcoming environment. Maintaining your business’s parking lot and walkways is a great way to show your patrons that you care. We offer solid and effective snow removal services that will make sure you can get out onto the street, too. If you are losing out on work because of a snow blockage, we can come down and help to move the debris so that you can get back to normality. Thanks to our snow plowing Ottawa businesses can make sure they aren’t foregoing money due to an unkept front of house. The winter can be a killer to your business when people find it hard to park or get to your front door. We can help make sure it’s just the temperature that drops in the winter, not your profits. With years of experience, our teams have overcome numerous challenging projects and have the expertise to efficiently and effectively take care of your snow removal needs. By working together, we’ll get you everything back in working order. When it comes to snow removal in Ottawa, there are many options open to businesses and residents. Sometimes dealing with the issue yourself is physically beyond you, or is something that you would be unable to make the most of as time goes on. The worse the snow gets, the more challenging it can become and the more likely it is that you’ll need local snow removal services like to help you out. As anyone who has seen the winters in Ottawa will know, the weather here can become pretty tough indeed. Although it’s an amazing place to live, even when the bad weather hits and you find yourself combating the elements it can be quite hard to see a genuine solution to the problems that you face. In a bid to help you find that solution, Brenning Paving and Construction has all right the tools and equipment that you could possibly need to get rid of that snow and ice fast. If you are sick of coping with constant snowfalls and wish to improve productivity and curb appeal, Brenning Paving and Construction can help. We can put in place the ideal solution to help your business combat snow once and for all. We’ve watched in the past as the winter whiteout leaves the city of Ottawa at a standstill. If you aren’t one for missing out on valuable business hours, then it might be time to contact our team for more information. Very quickly, we’ll put together a plan of action to cope with the excess of snow and make sure you have access to snow removal services that you’re confident about. We can be there quickly to pick up the snow using our plow systems and make sure you are never left out of pocket and productivity again. One of the most important parts about our local business snow service, though, is how quick we can be. We appreciate that time is money, so we’ll be there as fast as we can to offer a professional snow plowing service and help lift up the worst of the snow so that business can resume. Let’s make sure that this year your business is not left ruing the winter! 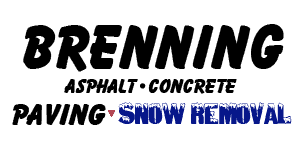 Get in touch with Brenning Paving and Construction — (613) 822-1316.